August | 2012 | Mom of Tornado - The realization of the last 30 something yrs. I have been receiving a Birchbox for the last 5 month and finally decided to post a blog about my experience. I wanted to see what the hype was with subscription box services. As a frugal mom I know that sometimes companies have promotions to hand out samples or send samples out so I was leery about actually paying for a service that would provide me with samples. But, I’ve been pleasantly pleased with the results. I have received samples to products I would never had thought to purchase The best part is most time they sneak in a jumbo size sample or a full size product. I don’t keep track of exactly when I receive my box so it’s always a nice surprise when it shows up. I walk to my desk and there it is my BIRCHBOX. Each month is themed and all the products you receive have to do with that certain theme. The cost for my Birchbox is only $10 bucks a month. Not bad. I think I spend more on secret coffee trips. Sample of Juicy Couture – Viva la juicy La Fleur -Love testing new scents. Miss Jessie’s Original – Curly Meringue– Great size sample and I can’t wait to try. My hair is naturally wavy so anything that will make a better curl for me is great to me. Miss Jessie’s Original – Crème De la Crème Conditioner – Let’s see how this works on my dry hair. TALIKA – Lipocils Expert – this is a lash serum that promotes growth. I’m kinda leary but the description shows that there are no side effects. I’m going to give this to my mom I know she might like this. So far every one of my boxes have had a special extra surprise.. this month it’s a SCHICK – Hydro Silk Razor. Who does not like a razor. The products come in a cute cardboard box that you can re- use as gift boxes, or storage containers. I even lined a box with wrapping paper and used it to store my son’s crayons. They also wrap it in tissue paper that can also be re-used if you don’t crinkle it up. I know I’m always the person running out to buy tissue paper so this has been useful for me. They also include a card or a pamphlet ,like they did this month with the products information and or other tidbits of fun, useful information. As a single mom with limited time to actually indulge in shopping this has been a great way to treat myself with high end samples I would normally not get and if I decide to actually keep using the product they also sell the them on the website. 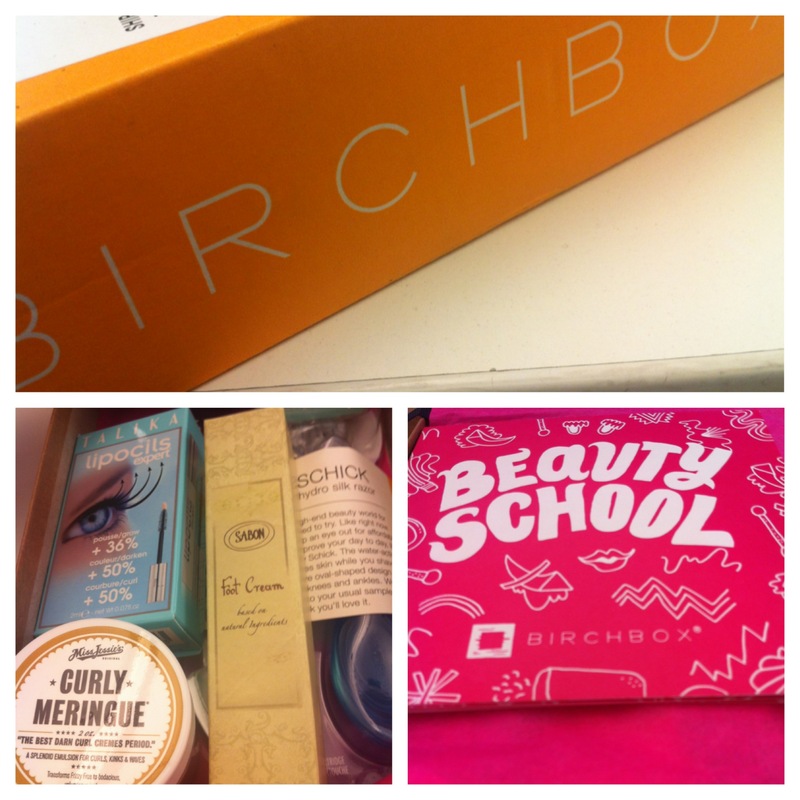 Want to check out Birchbox for yourself. Click here to be taken to Birchbox website. Are you a memeber to a subscription service? Do you like it? Is it worth the amount you pay for it? ** Disclaimer- I am a paying member of Birchbox and all opinions are solely mine. Where has my itty bitty monkey baby gone? When I was pregnant I did not realize that time would fly so fast. This has made me think if 3 yrs is almost upon me if I blink to long he might be 12 then another blink and he will be 18 going off to college. (sad face) My life since he was born has been completely dedicated to him and now that he’s a bit bigger, putting on his own clothes, eating out of his own plate with his big boy spoon and fork, deciding what movies he wants to watch and climbing the monkey bars on his own I’m feeling a bit empty. Now don’t worry I’m not crazy enough to want another kid. One monkey is plenty for me. I’m discovering that with his new found independence he still wants his mom. Instead of being the person that helps him with his task I’m the person that give him encouragement, praises his efforts and accomplishments. In the last three years I’ve learned that pasta with red sauce can be fun to eat, that monsters are funny not scary and that little boys will make just about anything into a car with their imagination. I’ve also learned I can draw a awesome train that my son request I draw every time we are around chalk or crayons. It’s been a great eye opening experience watching my son blossom. The way he looks at the world and tries to analyze it all. Textures, sounds, sensations, everything is new to him and he wants to do it all at once. Not one thing is more important than the other. And as much as I want to shield him from things that might hurt him , sometimes the lessons best learned are from experience. I can tell him a million times the rose bush has thorns and it can hurt if he touches it but until the day he actually grabbed and felt a prick did he learn that a rose bush has thorns and can hurt. Now he sees the bush and says “ Mama ouch” as he points to the bush. My monkey has no fear he will climb, he will jump and every single time he acts like a daredevil my heart leaps right out of my throat. I don’t think a day has gone by without me being amazed with my toddler. Things he does, or he says bring my own AWW moment every time. First it was when he said his first words, and then those words turned into phrases and now those phrases have a purpose and question. The ability for him to remember things is fascinating to me. I could have taken him to a park a few months ago thru a route we hardly ever travel but as soon as I passed the street he tells me the direction I should go to hit the park. At night we recap our day and I let him know what’s in store for tomorrow. In the morning he remind me about what we talked about and what we have planned for today. I’m like thank you honey for reminding me. So as I write this I’m staring at pictures of my little monkey when he was a tiny baby , and I can only imagine what the next few years have in store for me. I know our next big step is preschool! I’ve got my big girl pants on and am ready for the ride. How have you dealt with your baby not being a baby anymore?